Food, fiddling and family fun in Union Co.
MARYSVILLE – Gather your family, jump in the car and head to the beautiful countryside of Union County for the 11th Annual Covered Bridge Bluegrass Festival, Sept. 22-23. Less than a half hour from Dublin and 15 minutes from Marysville, this festival takes you on a fun, family adventure to the historic Pottersburg Bridge, one of Union County’s 19th century covered bridges, at 17141 Inskeep-Cratty Road, North Lewisburg. The festival features kids’ activities, 11 bluegrass and folk bands, food, history, art and bus tours of Union County’s covered bridges. Daniel Dye and the Miller Road Band, 11:30 a.m -1:00 p.m.
Rock Island Plow Co., 1:30-2:30 p.m.
Tyler Williams Band 3-4 p.m.
Glenn Park Banjo, 10:30-11:30 a.m.
Mad River Railroad, noon-1:30 p.m.
Bill Purk and The Muleskinner Band, 2-4 p.m. The Kids Zone, sponsored by Primrose Schools, featuring farm animals, a face painter and balloon artist. Free wagon rides, noon to 4 p.m.
An archery trailer provided by the Ohio Department of Natural Resources and Attaboyz Archery. Bus tours of Union County’s covered bridges will be offered during the festival, $10 for adults and $5 for children 12 and under. Tours will start on Saturday at 10 a.m., 12:30 p.m. and 3 p.m. and on Sunday at 11:30 a.m. and 2 p.m. Pre-register at unioncounty.org/event-registration/. Maps will be available for those who want to tour on their own along the Big Darby Plains Scenic Byway. Presentations and booths will feature Union County’s historic bridges, Union County and World War II history, and the history of Scotts Miracle Gro, which is celebrating its 150th anniversary this year. The Marysville Art League will offer its Coffee and Canvas painting class Saturday, 10:30 a.m. and 1 p.m. and Sunday at noon. Pre-register at unioncounty.org/event-registration/. Festival admission is $5, and free for children 12 and under. For more details, visit the festival website, coveredbridgefestival.com, or call the Union County Convention and Visitors Bureau, 937-642-6279. Bluebird Retirement Community is the festival’s presenting sponsor; Walnut Crossing Assisted Living and Memory Care, the music sponsor; and Honda of America Manufacturing, Inc. and the Ohio Arts Council are grantors. 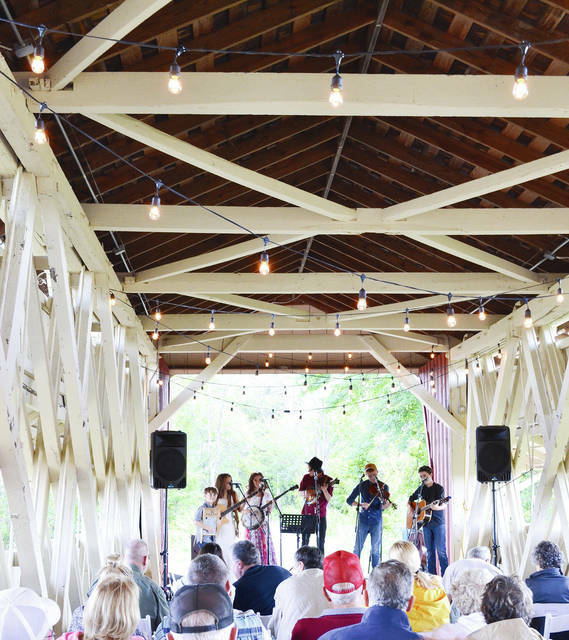 Dinner on the Bridge, a popular reservation-only event held on the Pottersburg Bridge the night before the Covered Bridge Bluegrass Festival, sold out again this year, the Union County Convention and Visitors Bureau reports.